Home Medias News Eyezen range is strongly growing with the launch of the new generation of single vision lenses. Eyezen range is strongly growing with the launch of the new generation of single vision lenses. After introducing Eyezen™ lenses for people with high visual fatigue symptoms in 2015, Essilor is now launching Eyezen™ Start the new generation of single vision lenses with an ambition to grow the brand and make it the reference on the single vision market. While standard single vision lenses compensate visual defects by considering only prescription for distance objects, Eyezen™ Start lenses benefit from a new technology to optimize the whole lens surface for both far and near objects, bringing the right power throughout the lens. Wearers benefit from a better visual comfort and a lens adapted to their new habits. 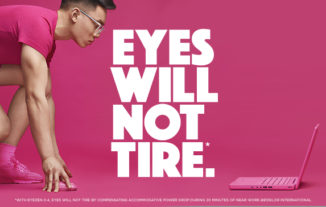 Eyezen™ lenses were a first response to connected lifestyle changes and intended to help alleviate high visual fatigue caused by intense screen use. Since then, people’s interaction with digital devices has continued to evolve: more people, of all ages, are connected and are using multiple devices. Essilor conducted an R&D study on digital behavior which shows that when using devices (smartphones, tablettes, eBook reader), we have higher eye declination and our eyes have to focus closer and at variable distances. With standard single vision lenses which do not take into account these factors, wearers may experience visual fatigue to differing degrees. So how do Eyezen Start lenses relax and protect your eyes? Eyezen™ Start lenses incorporate Eyezen™ DualOptim™ technology bringing a second zone of optimization in a single vision lens. Thanks to its R&D studies on digital behavior, for the first time, Essilor has added a new parameter to single vision lenses calculation. Eyezen™ Start’s lenses have two points of reference for near and far vision and take into account object’s distance and gaze direction. Eyezen™ Start lenses also help protect the eyes thanks to its advanced harmful blue-violet light filter*. Eyezen™ Start lenses were launched in UK, France and Portugal in January; Spain and the Nordic countries will see launches in the next months and other countries will follow throughout the year. *Harmful Blue light means a light with a wavelength up to 455 nanometers; greatest harm is done by light waves between 415-455 nanometers. 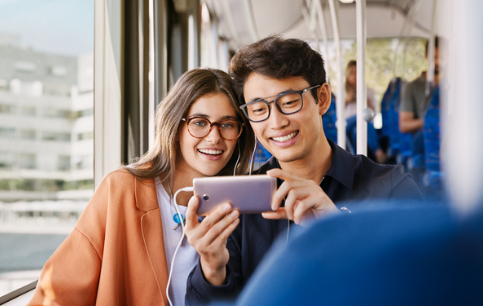 An original Eyezen™ lenses campaign from Essilor is showing connected consumers how to live their digital life to the fullest while relaxing their eyes. A spotlight on a new visual identity and consumer campaign from Transitions Optical is showing how Transitions® Light Intelligent Lenses™ help master light to enjoy every aspect of light with the comfort of everyday eyecare.